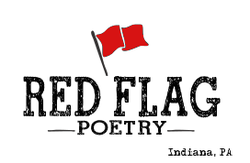 Red Flag Poetry is proudly supported by the English Department at Indiana University of Pennsylvania. Everyone enjoys getting a good piece of mail. With the rise of the digital age, however, it seems that most of us only find bills and magazine subscriptions in our mailboxes. Break up the boredom with a piece of poetry written by one of our talented poets and sent with love from our desk to yours! Each of our postcards features a wonderful poem and a beautiful piece of artwork, and will look great tacked up above your desk. So, take a trip to the mailbox and read a poem. It sure beats junk mail. We believe that poetry is an especially powerful form of art. It pushes us to think. It encourages us to explore and experience. It teaches us about ourselves, and asks us who we are. Red Flag Poetry intends to share our passion for poetry with you, because a good poem can change your life! What sort of poetry do you print? We are drawn to pithy poems that employ interesting and innovative language, images, or content. For our print postcards, we value a shorter form both for ease of presenting on a postcard and for a quick poetry fix on the fly. We read all submissions and welcome all kinds of poetry, so submit your work today! Okay, I want in. How many poems can I expect? I'm a writer looking to get my poems printed! What is your selection process? We read everything that comes our way! Submit up to three poems in one cycle by clicking the link to the left. We will contact you with a decision 2-3 months after the close of our reading period. Want to help spread the beauty of poetry? Click the Donate button below! Check us out on social media, Duotrope, or Poets & Writers!